I was watching the excellent Shrink Rap show the other day, the episode with Stephen Fry pouring out his life problems to Pamela Connolly. Like many overachievers, he has major father issues, primary among them being that his father has become the internalised voice of the cultural superego inside his head, telling Stephen that he's never good enough compared to great men of years past, and critiquing every second of his existence. Many of us can relate. Like Stephen, many of us are highly productive and well respected by our colleagues and friends, yet that little voice is always reminding us of our helpless inadequacy when faced with a seemingly impossible series of unfair objectives that are the fiendish creations of our unconscious minds. I feel like Gabe Rivera, creator of Techmeme, has become that voice inside the heads of many of the high profile technology bloggers of the day. Like Stephen with his forbidding father, these bloggers look to Gabe's site for emotional as well as intellectual approval. By extension this need reaches out to Gabe himself, now that he has admitted that he has been keeping a hand on the algorithmic tiller since 2005. This Freudian effect has caused major angst lately with many of the so-called A-listers, for various reasons. My mate Duncan Riley has a longstanding feud, with Duncan accusing Gabe of being Mike Arrington's stooge so many times that I don't even need to link to any of them, and Gabe accusing Dunc of making up stories. Robert Scoble has started in on Gabe over the last month with a similarly spiteful campaign to convince him to recognise Scoble's shameless whoring of himself all over Friendfeed and Twitter in Techmeme's algorithms. 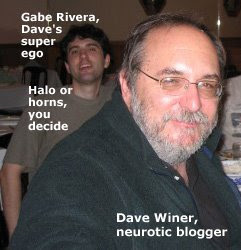 Now Dave Winer has cussed out Gabe for not allowing him the passing frisson of quasi-parental validation. In the late-and-not-lamented Tinfinger, I built a site which had a lot of Techmeme-like features, including a news aggregator which used a much less complex algorithm, so I feel I have some small amount of credibility to pass comments on these claims. Before I start, let me say that I like Gabe, and understand a lot of what he has been through, and what's more this blog seems to have a decent amount of memejuice on TM so I haven't gone through the frustration that these A-listers have been experiencing. Thus, please take my comments with the requisite grain of salt. In any case, Duncan's attacks may or may not have merit. From my knowledge of how algorithms work, I would find it perfectly believable that Gabe did not include any anti-Inquisitr code before Duncan's attacks started, nor consciously exclude Inq stories when he did meddle with the rankings. TechCrunch has authority in aggregators for a good reason, which is that everyone links to it and talks about their stories. The Inq started from zero, and building up links and chatter takes time and effort, which Duncan has put in for countless hours and will have to continue. Even if Arrington did activate his Hypno-Ray 2.0 and order Gabe to block Inq stories as petty revenge, in my opinion it does no good to kick against the system. The currency of this debate is authority, and even if Techmeme doesn't acknowledge the authority of your site, I think you can gain authority in non-numeric terms by being the Big Man and taking the high road. PageRank and clickthroughs are all very well, but respect and dignity of your peers and readers are also valuable commodities. Scoble's concerns are more complex. His view is that news is happening in increasing frequency on Twitter and FriendFeed, and the fact that Techmeme covers only blogs and the links between them is old hat. Scoble is being completely self-serving, but that's par for the course. He's a marketer, not a journalist. It's part of the job description, and he shouldn't be criticised for it. What about his point, though? My feeling is that Gabe is right not to pander to the Twitter/FriendFeed mafia. News may very well break on Twitter, but do people really want to open up their faux New York Times to see a headline news report that is only 140 characters long? Or, worse, a breaking issue which you have to comb through 50 one-sentence comments to comprehend? No, for the sort of service Techmeme is, it is correct to stay in the blog and news world, because if TM is to be the replacement for the newspaper frontispiece then each headline has to link to a true work of journalism. No, Robert, it's just not possible to commit a mainstream-consumable act of journalism in a single tweet or FriendFeed comment. Stories that are worth reading take longer than that to be told, and should be told in a longer form which allows a coherent narrative to be constructed - not necessarily by a professional journalist of course, but in a medium which allows for a fully-formed thought to be expressed, not just a whim skimmed off the top of the head. Sure, Techmeme might miss out by five minutes on the breathless pronouncement by Scoble or someone else of the latest Steve Jobs mystery illness, but that's a small price to pay for the quality of the product Gabe wants to put out for the masses. On Dave Winer's whinge... first, let me clear up a common complaint. Gabe has said on multiple times that news items may appear on Techmeme with no accompanying link item, but that doesn't mean there wasn't one that qualified the original to appear on TM - just that the linking site didn't have enough memejuice to appear itself. Items appearing sans linkage doesn't mean that they've been boosted for nefarious means. Gabe has repeated this arcane piece of algorithmic cruft often enough that I feel that accusations of this sort by A-listers now constitute deliberate obfuscation, as they should know better if they had been paying attention to previous scuffles. Dave kind of gets the superego effect, judging from later comments in the above-linked FriendFeed discussion, but his reaction is to want to kill part of his own brain. Needless to say, this is not psychically healthy. Building a new Techmeme is not a technically difficult thing to do. I did it, for the most part, and I'm no gun programmer. Half a dozen others did the same thing and got no traction. It is futile at this point, more than at any other time. After all of that, I have to admit that I don't visit Techmeme any more, and haven't done so consistently for a year or so. I don't find tech news to be relevant to my day, immersed as I am in the sporting niche. For those to whom it is relevant, I don't see that the site has changed all that much since it began. For better or worse, Gabe has made it quite clear that this is the Techmeme we're getting, and he's not prepared to do anything drastic at all to change a winning formula. His intransigence is frustrating for a lot of people, but that's just the way he is, so better to leave him alone and focus on yourselves. It is perhaps no coincidence that all this Freudian sturm und drang is caused by men fighting over the ownership of the cultural superego, something usually associated with the founding fathers of a society. Arrington is a founding father of Web 2.0, so Duncan is fighting The Man, literally. Scoble and Winer were their own sort of founding fathers in their time, though evidently they are sensitive about their influence waning. Gabe stands in the middle, with his hand ever so slightly guiding the Techmeme tiller, trying to sail to the other side of the teacup. Let us hope he does not succumb to what Sigmund used to call the "primal horde".